Since her first appearance in 1992. Harley Quinn has captured the hearts of both fans and comics artists alike. The Harley Quinn Red. 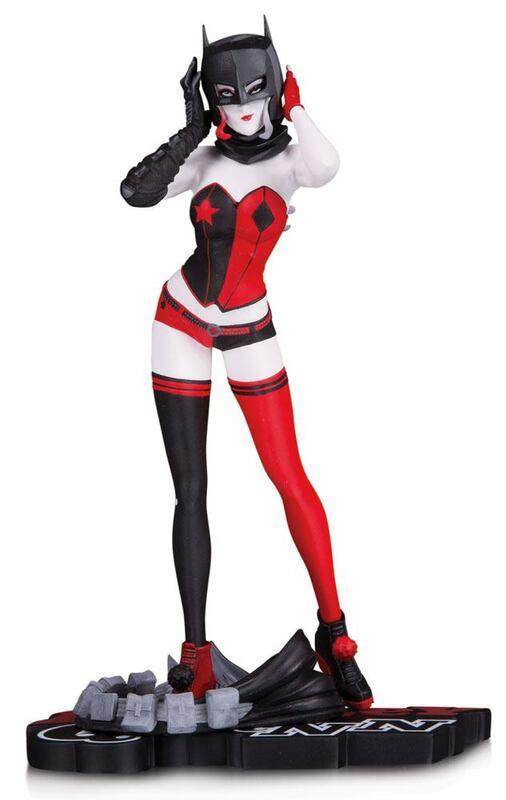 White & Black collection of statues are based on various depictions of Harley re-created in vivid 3-D detail. This latest statue in the series comes from famed artist John Timms. Harley Quinn has come into possession of Batman's cowl. cape and utility belt. While there's surely a great story about how she got it. what's more intriguing is what mischievous adventures she can undertake while beneath the cowl. Will she frame the Batman in a crime spree? Or auction off these missing goods to the highest bidder? Whatever choice she makes. it's a good guess she'll be smiling when she does it. Limited to 5.000 pieces and individually numbered. Figures measure 18 cm tall. Designed by John Timms; Sculpted by Paul Harding.